NEPALGUNJ, Aug 2: Local leaders and commoners say that they have found several vulnerable points along the main canal of the Sikta Irrigation Project. After an inspection of the canal on Wednesday, they claimed that there are similar other weak points between 17.7 km to 35 km stretch of the canal in Dhakeri and they could collapse anytime. Talking to Republica at the project site, Hari Regmi, a local of Raptisonari-9, said that the weak points are easily visible. 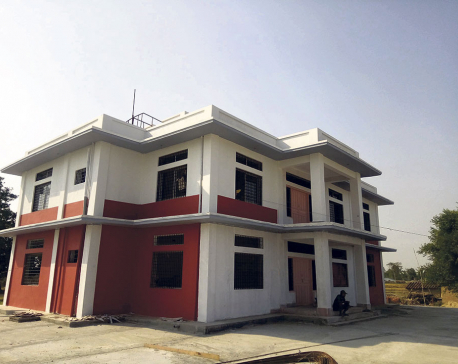 “We found several locations with shoddy construction,” said Regmi adding that if the contractor had tested the soil, the risk could have been avoided. Central member of the Federation of Nepalese Chambers of Commerce and Industry Krishna Prasad Shrestha had led the inspection Wednesday. Shrestha criticized the government for not making timely intervention to prevent losses that a collapse of the canal could cause in the districts. The foundations of the slopes of the canal on either side have already seen soil erosion and it is going to cost a huge amount of money to repair the damaged portions, according to him. 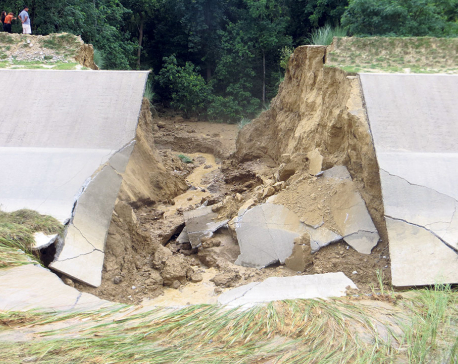 “We found several vulnerable points along a three-kilometer stretch and this shows there had been utter carelessness in the construction,” complained Shrestha. Government’s engineers also admit that there are several weak points along a 14-km stretch of the main canal. An engineer of the project Bijay Kumar Jha said there are major problems in the 14-kilometer stretch. “The dispersive soil is the main culprit along the route which erodes easily during the rainy season,” said Jha.